One of the most thoughtful exhibitions of 2018 was "The Feminine Sublime," a small group show featuring mostly paintings by five women artists. Organized by Constance Mallinson for the recently closed Pasadena Museum of California Art, the exhibition included works by Merion Estes, Yvette Gellis, Virginia Katz, Marie Thiebault and Mallinson. The exhibition's premise was to reinterpret traditional patriarchal notions of the sublime from a feminist perspective. In her catalog essay, Mallinson explains that historical landscape paintings by male artists are characterized by "the viewer or male subject (using) intellect, or reason, to overcome, or transcend, the terror associated with the wild unknown." By contrast, the five female artists take a less idealized view of the natural world through a shared recognition of "humanity not as disembodied mind, but as material body." These artists, in other words, immerse themselves (and viewers) in nature. Rather than appear overwhelmed by its grandeur as their male predecessors were, they view nature as fragile and jeopardized, responsive to the detrimental effects of industrialization and climate change. Although the exhibition featured only one or two works by each artist, Mallinson's curatorial vision was consistent throughout. In her panoramic painting "Still Life in Landscape," Mallinson depicts massive piles of realistically rendered, intricately detailed consumer detritus. While colorful and vibrant, the imagery is anything but joyful when we consider its ecological implications. Similarly, abstract paintings by Gellis and Katz call attention to our rapidly deteriorating planet. Both artists employ gestural brushwork to refer to aspects of the real world rather than to ephemeral ones, as the original Abstract Expressionists had done. Gellis simulates the effects of oil spills in paint, while Katz fashions dark, murky surfaces that could be interpreted as mutating or decaying topographies. Thiebault was represented by one of her characteristically energetic abstractions in which geometric and organic forms collide in reference to inherent conflicts between technology and nature. Estes exhibited two dazzling patterned landscape scenarios dominated by a hot orange palette that referenced global warming and wildfires. As 2018 came to a close, two year-end exhibitions provided a welcome opportunity to delve deeper into the work of the latter two artists. Thiebault exhibited a recent series of paintings at Launch LA; Estes was represented by a twenty-year survey organized by the former Los Angeles County Museum of Art's Curator Howard N. Fox for the Craft & Folk Art Museum, now the Craft Contemporary. As her survey exhibition revealed, Estes' roots are in the Pattern & Decoration Movement of the 1970s, which was closely associated with Second Wave Feminism in that female (and some male) artists were using formal vocabularies derived from domestic sources such as fabrics or wallpaper to create aesthetically dynamic works of art. As formalism waned in the 1980s, Estes and other P & D artists continued to employ patterning, but more as a vehicle for expression on a variety of topics and not simply for art's sake or as a feminist trope. For Estes, this has involved ongoing articulation of environmental issues, and its effects both on the planet and its inhabitants. In lieu of canvas, Estes' employs African and Japanese printed fabrics as the foundations over which she applies paint, photo transfers, additional fabric, and, in some instances, glitter. Through a labor intensive process of layering painted and stenciled imagery over already existing patterning, Estes creates richly complex monumental collages characterized by psychedelic colors and visionary imagery that curator Fox describes as "simultaneously beautiful and disturbing," in that they are at once breathtaking to behold and confrontational. 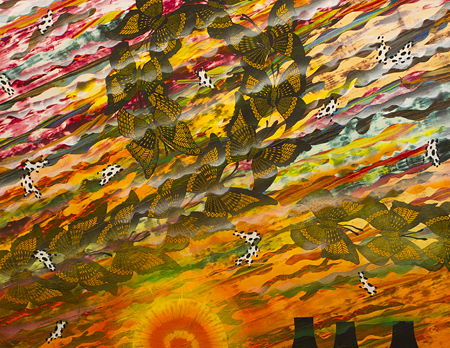 In "Los Alamos Sunset" (2014) a dominant hot orange palette, repeating diagonal patterns, and a swirling ribbon-like motif that sweeps through the center of the composition convey a rhapsodic temperament, yet the apparent expression of rapture is countered by the real world reality referred to in the lower right corner — silhouettes of the nuclear reactors that underwent a drastic meltdown as a result of the 2011 earthquake and tsunami in Fukushima, Japan. Additionally, once we become cognizant that patterns scattered throughout the composition are actually butterflies, we gain our empathetic entrance into the scenario. What happens to butterflies when the world falls apart? And, in turn, what happens to other forms of life, like, say, people? A similar sequence of response and reasoning occurs with Estes' collages that feature animal life, as in "Memento Mori" (2014), where a lone bird at lower left (a stand-in for the viewer) bears witness to the remains of extinct elephants whose ghosts float away in sky bubbles. Bird imagery is also present in Thiebault's newest body of work, where they appear flying within passages of emotionally charged abstract paintings inspired by the industrial landscape of the World Port of Los Angeles. As a master orchestrator of the compositional dynamics that the Abstract Expressionist Hans Hoffmann defined as "push/pull" and "expansion/contraction," Thiebault enlivens her paintings through multiple interactions of bold colors and shifting perspectives. By introducing emblematic images of birds in flight into the mix, she has effectively humanized her abstractions by looking at environmental chaos from an avian perspective. Whether we consider the birds to be literally confounded as their flight patterns become increasingly dangerous due to continued industrialization, or we view them simply as symbols for humanity navigating the bigger picture, their inclusion in the paintings makes the work more immediate and accessible in representing the perilous state of our planet.